Lately, everything has been pushing me to a specific place. Here. Now. Blogging consistently about things I know to help other business owners be successful. But I’m jumping ahead. Let’s start at the beginning. I read a lot. You can almost always find me in the middle of a book or five. Reading late into the nights was the thing I got in trouble for most consistently growing up. That’s right. The thing I got in the most trouble for growing up was for reading. Such a rebel, who knows how my parents survived? There are times though, that when I’m reading, I find them directly applied to my life. It doesn’t matter if they’re fiction or non-fiction, what matters is that at that moment in time, my life aligns. The first time I really noticed it was when I was stuck at LAX. My plane kept being delayed and I had finished my book. Left with nothing to do in the pre-smart phones world, I went into the bookstore and picked up a book with a bright red cover. It had received good reviews, so I thought nothing of purchasing a book called, Waiting by Ha Jin. Then my flight was delayed again. In the book itself, I kept waiting for something to happen. It was a slow, quiet book of internal struggle with many layers. Let’s just assume it’s hidden complexities were too subtle for my stuck-in-an-airport-waiting-for-my-plane self. My flight was delayed again. Still nothing happened in the book. The next time it happened was when I lived in Denver and my car broke down in a snow storm. I had managed to guide it off the freeway and sat on a quiet city street in the snow waiting for the tow-truck. Luckily I had a book with me. It wasn’t until 45 minutes had gone by that I looked up from my book to realize it was going to take a while longer. The book? One Hundred Years of Solitude, by Gabriel Garcia Marquez. Luckily it doesn’t always happen and I didn’t end up fighting children to the death when reading the Hunger Games, nor did I find myself living on Molokai with leprosy. Last was one of those nights. Walking my dog along the dark city streets, I listened to the last chapters of Known by Mark Schaefer. With each step, my restlessness grew and ideas began to take form. Did you know I first started blogging in 2001? My family and friends knew, but as soon as I got laid off after 9/11, I put my focus into finishing my MBA and finding a new job. Later, I switched blogging platforms, and when I closed that blog down, I exported all the posts and had them bound into two books in order to save them. It turns out I accidentally gave one of the books away in a “Spark Joy” purge. Oops. Somewhere in the world, hopefully someone is enjoying my blog posts from 2002-2006. Do you care that I started my first blog in 2001? Not at all. Nor should you. My blogs were always for myself, for fun. The last thing I wanted to do after working 60+ hours a week in marketing, was go home and work on a marketing blog. The very idea of it put me to sleep. In my head they were separate – blogging about marketing, or blogging about my life. In reading the blogs of people I look up to, like Seth Godin, Chris Brogan, and Mark Schaefer, they all say the same thing. In fact, everyone says that, even me. I absolutely teach my marketing and social media students about the need to be consistent. Do what I say, not what I do, only get’s one so far. 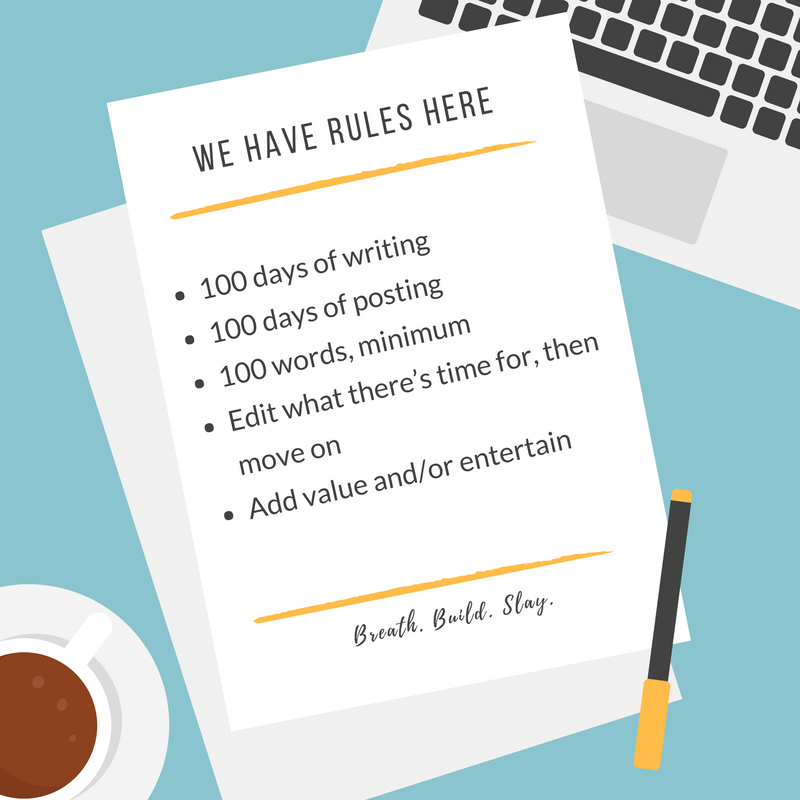 Because it’s me, and I do better with challenges – even when I give them myself, I’ve designed a blogging challenge for myself. It has rules. Inspired by everyone I’ve met at Social Media Marketing World, and those I’ve looked up to over the years, I’m embarking on a 100 day challenge of my own making. I know I get a lot from the people who inspire me, now it’s time for me to do a better job of giving back. With any luck, someone will find value in my stories, experiences, and ridiculous fixation with needing to know things. Some days you’ll hate it. Some days I’ll hate it. Other days, it may make you laugh or add something to your day. Those are the days I look most forward to. And in the meantime, if you have specific marketing questions for me, you can always find me here!